"What you read in these pages is what I remember-- every day." Charles Kniffen's true story reveals the lasting hardships and struggles of combat, even fifty years later. Seven months of combat in Vietnam transformed to hurtful, unforgettable effects for Kniffen and his loved ones. Post-Traumatic Stress Disorder, PTSD, can rule Kniffen's life. Now, he reveals this unfair ruling through Fifty Years in a Foxhole. Fifty Years in a Foxhole is an episodic account of the author's seven months in combat in Vietnam. He and his platoon were in several major engagements including the Battle of the Hills and Operation Utah. The main focus of these operations are the lives of the marines and attrition through action and "friendly fire" as they endure these pointless dangers. "Charles Kniffen is a natural writer - the words just flow. Intense, to be sure, but also compelling. He tells the story of his time in Vietnam, and what followed that time. They say "war is hell" but just because the war ends does not mean the warriors can ever come home, at least not as the same person. If I say any more I'll say too much, and not as well as Kniffen does." CAMP HILL, PA — As the film ended, after nearly 2 1/2 hours, the credits ran and no one stood. No one spoke. No one reached for their phone. As the last credit rolled, all quietly stood — a room of over 300 movie patrons who were total strangers to one another. Quietly and politely, as if at a solemn funeral, each exited their row and walked to the door. Some spoke only in hushed tones as we emptied out. To say “American Sniper” had an impact on the audience would be an understatement. It was the most powerful reaction to a film I have ever witnessed. Why this reaction? Since there were no exchanges with the patrons, I can only imagine they were thinking similarly to me. Eastwood’s movie had struck an inner chord of human nature — a deep sense of loss coupled with the sincere respect for Chris Kyle, the Navy Seal played by Bradley Cooper. But, that’s not the only thing. In fact, the overriding realization is the cost of war — whether it is the mental anguish a soldier faces, or the horrors the populace in a war zone encounters, or the early deaths of so many on both sides, or the toll on the families back home — during and after the conflict. This was not a film that glorified war — or the SEALs — or our country’s invasion of Iraq. It was not NRA propaganda or a recruiting tool for sniper training. Those that are trying to make more out of it than an honest appraisal of the human price paid in such conflicts are completely off base. If nothing else, regardless of our beliefs and all of the disagreements we have among us as Americans, we must rally behind our veterans — especially those that served in battle zones, and especially those that carry the scars, whether physical or mental. These men and women served our country. Whether or not you are proud of the results or agreed with the circumstances, I urge you to please support them. 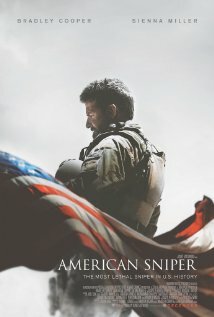 If you haven’t seen the film and are unsure about how you feel about our veterans, the $9.50 per ticket to see “American Sniper” is worth every penny. Mechanicsburg, PA – Sunbury Press has released author Susan Dahlgren Daigneault’s post World War 2 biography of her famous father who was known as “Maine’s Sergeant York.” Dahlgren was awarded the Congressional Medal of Honor by President Harry Truman in recognition of his heroics during the war. His daughter relates the price paid by the family during the years after. Because American troops are in far off places in this world, fighting for causes that sometimes cost them their lives, and because our veterans from World War II are a dying breed, it is entirely fitting that we save the stories of our veterans so that their experiences and their voices will never be forgotten and so that current generations might learn about the horrors of war and how the impact of battle never really goes away.One such story is about a Maine man who spent World War II as a member of the Texan 36th Infantry Division. In the Shadow of a Mountain tells the life story of one of Maine’s Medal of Honor recipients, Edward C. Dahlgren. 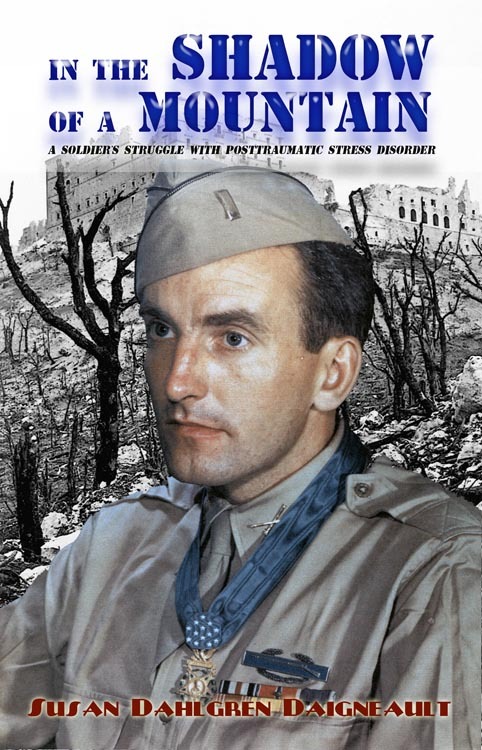 It is a timely manuscript in that it details Dahlgren’s struggles with Posttraumatic Stress Disorder, a condition affecting many of our military veterans returning from war zones today. It is a book that will help readers to know about the devastation of war and how we must always provide care and comfort for our returning veterans. When Lieutenant Edward C. Dahlgren stepped off the train that brought him home from a combat experience that should have killed him but didn’t, he wore a chest full of medals, carried a heart full of sorrow for his men who never came home, and was faced with the daunting task of finding a way to live a life worthy of his survival. In November 1945 the guns of World War II were silenced but the battles continued for Lieutenant Dahlgren and many other soldiers who were haunted by the gruesome events of their war. He had lost 40 pounds from his slight frame and suffered from jaundice. He stammered when he tried to talk and his hands shook so badly that he couldn’t hold a cup of coffee without spilling most of it on the counter or in his lap. He suffered night terrors in which German soldiers came back from the dead and pointed their rifles at him. For decades, he suffered in silence until another war erupted and a name was given to his troubles: Posttraumatic Stress Disorder. Once described as “Maine’s very own Sergeant York”, a reference to the movie about World War I Medal of Honor recipient Alvin York, Edward Dahlgren received his own Congressional Medal of Honor from President Harry Truman at a White House ceremony in the East Room in August of 1945. Following the ceremony, Dahlgren returned home to Maine’s northern most county to live a life of quiet dignity and amass a legacy of public service. Because of his service to his country in the time of war and his subsequent service to his community and his state in a time of peace, the flags of our country flew at half staff on the day of his funeral and when his passing was announced, The Bangor Daily News honored him with front page coverage. The book, In the Shadow of a Mountain, is the story of this unassuming hero who grew up without a father in the Swedish colony of Northern Maine, who went to war shortly after his mother’s untimely death, who returned home so poor that he wore his army uniform pants until they wore out, who raised a family of four on a paycheck that sometimes didn’t stretch quite far enough, who instilled a passion for fairness, honesty, hard work, and a love for learning in his children, who gave generously of his time to help establish a veteran’s clinic and nursing home in Northern Maine, and who all the while suffered with PTSD. In the end, the way he lived his life was most definitely worthy of his having survived the horrors of his war. And, the way he lived his life provides lessons for all of us on how to live well even while struggling to do so. “Sue Daigneault honors her father, the war hero, her father the anguished soldier, her father the man. She writes with passion and unflinching honesty. This book about an embattled World War Two Congressional Medal of Honor recipient could be read by every family of a returning soldier today with a knowing nod. Ed Dahlgren’s life in rural Maine deserves to be remembered. We all owe Ed Dahlgren a huge debt. At the point of decision, in the midst of ferocious fighting that defined the start of the demise of the Nazis, he demonstrated that rare heroism that changes the course of battle. This book gives us a chance to see what people can do when they know that everything depends on them. Outstanding reading. Edward C. Dahlgren, a Medal of Honor recipient, was a quiet, competent man who stayed off of the skyline, except in firefights on the battlefield. While the majority of the Medal of Honor Society members meet annually, I never met Ed until a deer hunting trip in Maine. He would not attend big events or tell his story; that was not his personality. Our armed forces personnel know their leaders and their true warriors, but no one knows an individual better than a daughter. Sue has done an outstanding job in writing her father’s story, the life of a true American warrior. This is a “must read” for all Americans who appreciate our freedom and love our great country. — Colonel Wesley Lee Fox USMC (Ret), Medal of Honor recipient, author of “Marine Rifleman: Forty-three Years in the Corps”, “Courage and Fear”, and “Six Essential Elements of Leadership”.